I have a simple rule of thumb for can it tow that. 13% of the GVWR of trailer. That would be the most that tongue will weigh @ 13%, add in 100 for the hitch, and now you will know how much payload in addition to you and your stuff will be needed. Another way to look at it, each receiver has a load limit on it, anywhere from 1050 pounds up to 1320 pounds. Subtract that from the payload, now is there enough for you, your passengers and other stuff? My Platinum has the Max Tow, which includes a 1320 pound receiver, but only a 1560 pound payload. I weigh 240, well, guess I better not have anything else in the truck, not even a can of pop or it is over the limits. Realistically, I can go up to 7600 pounds GVWR with what I have, but not a pound more. 7600 @ 13% is 988+100 hitch, so that leaves 472 pounds of payload. 1560 may seem like a lot, until the math is done. This is why I recommend a minimum of 1800 pound payload for a 9K trailer, it leaves roughly 600 pounds for salt bags and cargo. Don't trust the RV dealer BEFORE the sale. Do not trust him when he says you can easily tow the trailer he is trying to sell you with an F-150. Take the data, go find an F-150 that has the right payload. Decide NOTHING based on a salesperson's words. They have everything to gain by misinforming. When you start talking about 9000 lb trailers you are in 3/4 ton territory. Yes, a 1/2 ton properly equipped will handle that much weight on paper. But good luck finding a used one so equipped. They are special order unicorns that just don't turn up often on the used market. The 6.2 gets 14 combined MPG from what I’ve read. It just doesn’t seem necessary. That sounds about right, but a 3.5 EB or 5.0 V8 are only going to be about 2 mpg better overall and the 6.2 will get better fuel mileage when towing. You'll burn about 10 gallons more gas to drive 1000 miles with a 6.2 gas engine and F250. Used F250's are out there and unless you just have to have the high end trim levels don't cost significantly more than an F150 if you go with a gas engine. 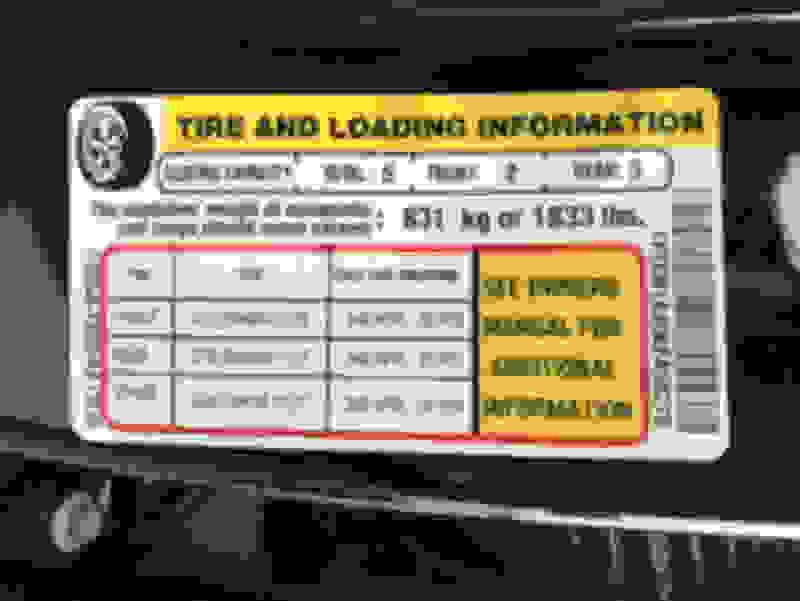 look at the yellow sticker for the payload, anything over 1800 pounds and you are golden for what you want to tow. 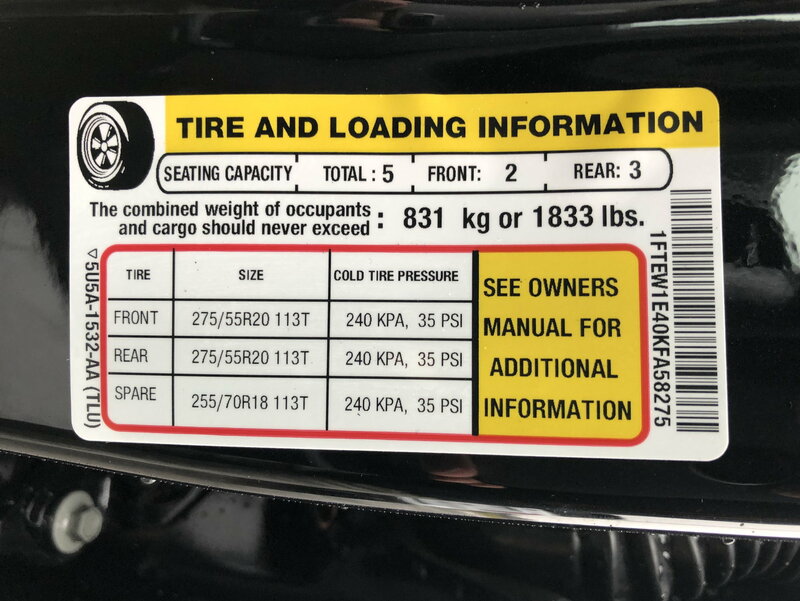 You're more likely to find 1800 lbs payload on a regular cab or crew cab than a supercrew. And even if you do the tongue weight+ WDH with a 9000 lb trailer is almost 1300 lbs. That only leaves 500 lbs for yourself, passengers, and cargo in the truck. That is cutting it a little close if 2 adults are in the truck, my wife and are 370 combined (220 +150). That only leaves me 130 lbs for other "stuff" in the truck. If it were me, I'd either be looking at F250's. Or trailers with about 7000 lbs GVWR instead of 9000 lbs GVWR. First, the MPGs. Am I nuts to think I’m going to get 22-23 MPG on the highway with the 3.5? I’m not a lead foot by any stretch. I’m under the impression that an F250 with the 6.2 is not going to exceed 14 in any kind of driving. I had a 99 Chevy with the 5.3 that got 16 MPG regardless of what kind of driving I did. Here is the sticker from a test drive last week. This was a new ‘19 Supercrew with the 3.5 EB, max tow, sport package and navigation. maybe not 22-23, but over 20 is doable. That truck is right in the ballpark for what you are looking for. Bad advice. 9000 pounds towing is NBD at all for my truck. The best MPG I have had with my 3.5TT is 18.5, unloaded, driving 69 mph. I have 3.55, 6 speed, SuperCrew. I think so. I have a 2014 3.5L EB, 4x4, Supercab, XLT, long bed, with Max Tow and Heavy Duty Payload Package which comes with a 3.73 limited slip axle. I did a 90 mile trip, completely empty, with about 30 miles on interstate and the balance on a two lane country road. The best I could get was about 20.5. If I had run the entire trip at 60, I may have gotten 21 or 22. I've noticed my mileage falls off fast when I get above 60 mph. In fact, the sweet spot is just above 55 mph. My general driving, when not out on the open road, which is mostly in subdivisions and country roads, but zero stop and go city driving is running about 14.5 to 15.5. It will go up a little when summer get here and the gas stations switch over to summer gas. I managed just over 21.5 mpg on the freeway for day long road trip. '17 3.5 10 speed, no cargo to speak of. I can load my RV to 8k and my truck really lightly and it'll scale right at max, 7050#.